How Can Christians Be Holy As God Commands Them? We are told to be holy as God is holy, but how is this even possible for us? In the Old Testament, one of the most common commands given to Israel was for them to be holy (Lev 11:44). As high priest, Aaron and his sons were to “take part of the blood that is on the altar, and of the anointing oil, and sprinkle it on Aaron and his garments, and on his sons and his sons’ garments with him. He and his garments shall be holy, and his sons and his sons’ garments with him” (Ex 229:21), so even the garments they wore were to be holy and what made them holy? It was following the specific commands in preparing the garments in exactly the way God commanded them, so even inanimate objects can be deemed holy before God, but even more importantly is the man inside the garments. Like the New Testament requirements for the pastorate, they had to live a life above reproach (Titus 1; 1st Tim 3), so since “The holy garments of Aaron shall be for his sons after him; they shall be anointed in them and ordained in them” (Ex 29:29) was essential for them to serve, how important would it be for the priests to abstain from sin? Over 650 times the Bible mentions holy or holiness so it is very important to God, but how can we sinful human beings ever hope to be holy? Think about this: Would God command us to be holy if it were not possible? Jesus must have sent a serious shiver down everyone’s spine when He said, “unless your righteousness exceeds that of the scribes and Pharisees, you will never enter the kingdom of heaven” (Matt 5:20). That was a frightening thing to many, I’m sure. Everyone regarded these men as holy and as not being sinners, and they thought they could never live up to that standard, however, upon close examination, the Pharisees and the scribes were esteemed as holy, but were they in reality? Our righteousness must be seen before God and not others. Those who held them in high esteem won’t help them on Judgment Day and it won’t help us either if we’re not saved. The righteousness of God and the righteousness of the Pharisees and scribes isn’t even close, but the righteousness of God is what it takes to enter the kingdom. The truth is they didn’t have any righteousness, unless you’re speaking of self-righteousness. Jesus said there were “some who trusted in themselves that they were righteous, and treated others with contempt” (Luke 18:9), so it wasn’t that they were righteous before God or men because they looked down on others. Though they were held as righteous before men, they’re not the ones who they’ll stand before on Judgment Day (Rom 14:10). Jesus rebuked the religious leaders by saying, “You are the ones who justify yourselves before men, but God knows your hearts. For what is prized among men is detestable before God” (Luke 16:15). It doesn’t look like the scribes and the Pharisees righteousness is enough for Jesus, so whatever they had, we must have a better righteousness…and we do, as we shall see. When the sinner comes to the cross with nothing but sin in his hands, he confesses that he is in the most hopeless of all situations, unable to save himself, and so he must look outside of himself for help, and that is where we see Jesus, like the Prodigal’s Father, standing and waiting to embrace us, and when God brings us to repentance and we put our trust in Christ, He provides the righteousness we will need to enter the kingdom. There is absolutely no other way to be found worthy except by the precious blood of the Lamb of God, but until we are broken before God, He cannot fix us. Until we are emptied of ourselves, He cannot fill us with His Spirit. To acknowledge our utter helplessness to save ourselves is to give God all the glory because salvation is fully a work of God….start to finish. After a person’s been born again, they receive the same righteousness that Jesus has. They become a brand new creation in Christ (2nd Cor 5:17), and now God sees us as having Jesus’ very own righteousness (2nd Cor 5:21). That’s the only way we can enter the kingdom and there is positively no other way to be declared holy but through Jesus Christ (Acts 4:12). Many who I witness to are waiting until they “clean up their lives” but that is a tragic mistake because they can’t do it. 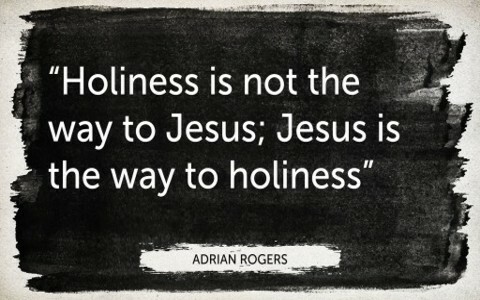 The late Adrian Rogers said, “Holiness is not the way to Jesus; Jesus is the way to holiness,” and he’s exactly right. Otherwise, it is just not possible for human beings to be declared holy before God. I wouldn’t trust the best 5 minutes of my life to buy me a second in heaven. That’s why we are forced to acknowledge our helplessness. God wants us to know we can’t save ourselves by being “good.” We can do nothing without Christ (John 15:5) which means we cannot save ourselves. That’s because Jesus’ has done it all…paid it all….for all who trust in Him, but after conversion, we can do all things…through Him (Phil 4:13), and should do the things He commands (Matt 25:34-39). The blood of the Lamb of God is the only way we can be made white as snow. Through the precious shed blood of Christ, we are plunged into victory and our separation from God is over. We are reconciled back to God by God Himself, through Jesus Christ. Jesus came to give His own life as a ransom for many (Mark 10:45) and so Jesus, Who is God, acted intentionally to save us. God tells us we need a Savior and then provides the Savior. Incredible. Being “religious” is never enough, in fact that’s worse. It’s not about religion; it’s about having a personal relationship with Jesus Christ. “The Pharisee, standing by himself, prayed thus: ‘God, I thank you that I am not like other men, extortioners, unjust, adulterers, or even like this tax collector” (Luke 18:11), and trying to justify himself, he boasted, “I fast twice a week; I give tithes of all that I get” (Luke 18:12), however “the tax collector, standing far off, would not even lift up his eyes to heaven, but beat his breast, saying, ‘God, be merciful to me, a sinner’” (Luke 18:13). One man went home justified but the other man went home dignified. We know which one received mercy. It was the one who didn’t trust in his own righteousness that was justified. This verse might be my favorite one of all and so I’ve committed it to memory. It proclaims the gospel of Jesus Christ and is in 2nd Corinthians 5:21. Paul writes, “For our sake he made him to be sin who knew no sin, so that in him we might become the righteousness of God.” Jesus becoming sin for us doesn’t mean Jesus sinned. It was our sin not His that He bore on the cross. It was He who was both the Just and Justifier. It was Christ Who justified the many, so the many should pour out their thanksgiving and praise. It not for God’s love (Rom 5:8), we would have no chance. Because of God’s love, there is no doubt (Rom 8:35-39). Previous post: Is “By His Stripes We Are Healed” A Promise To Heal Everyone? Next post: Are Quenching and Grieving the Spirit the Same?